What Did The Children Learn in School Today? Those are sentiments that drive every nation state as it seeks to shape the thinking of its children. Some states have long histories from which to develop those sentiments. The modern state of Israel has an extremely short history. It came into existence in 1948 under trying circumstances, a tribal band of immigrants from Europe who had survived the Holocaust. I was reminded of Pete Seeger singing Tom Paxton’s lyrics when I read an account in the Guardian, about a forthcoming book by Israeli scholar Nurit Peled-Elhanan. Peled-Elhanan is a mother, a political radical, and the daughter of the famous Israeli general, Matti Peled who in retirement, has become a leading activist in the Israeli peace movement. She comes to her research from a family with deep connections to Israel’s history. Her brother, Milo Peled, is the author of A General’s Son, scheduled for publication by Just World Books in the Spring of 2012. Peled-Elhanan, a professor of language and education at the Hebrew University of Jerusalem, has studied the content of Israeli school books for the past five years. Her book, Palestine in Israeli School Books: Ideology and Propaganda in Education, will be published in the United Kingdom this month. She would like to find a Hebrew publisher. So far she had not found one. Peled-Elhanan tells the Guardian she found a prevailing racism that saturates Israel’s early education textbooks. Israel has a short history which it has built from ancient biblical stories and the recent horrors of the Holocaust. For nation building, the pairing was perfect. For stealing land, it was illegal, a distortion of actual history and, for good measure, immoral. Israel did what other new nations do; shape a narrative that rationalizes past conduct. Unfortunately for the nascent state, it entered history after colonialism had become passé. Israel became a state just as western nations were relinquishing control of their colonies to carefully-chosen, and subservient leaders. As a new colony in a period when the colony concept had passed its shelf life, Israel had to create an even more distorted narrative than the American colonialists who had more than a century to sell their tale of manifest destiny. The compressed period of time in which Israel’s historical narrative was created, required outside help. Thanks to the tribal outreach that extended deep into the consciousness of the West, this late-stage post-Holocaust colonialism succeeded. It succeeded because it was built around racism, an easy sell in the West, which needed to maintain control over “other”, non-white, populations. It helped that most of those “others” belonged to a religious tradition, Islam, which colonial powers had never fully understood, nor trusted. Fifty years after Pete Seeger sang Tom Paxton’s prophetic folk song, American culture retains sufficient belief in its own “manifest destiny” narrative to continue the expansion of worldwide American hegemony. Hegemony fattens the profits of what Dwight Eisenhower described as our “military/industrial complex”, profiteers who just happen to belong to the 1% of our population now facing protests from the Occupy Wall Street movement. The tribal nation of Israel (“we are a Jewish state”) links to the 1% through a common need to wage war. Next up on Israel’s agenda? Iran, of course, as MJ Rosenberg explains in a recent Huffington Post piece. A commonality of purpose ties Israel to two major influences in American society, the military/industrial complex and the Israel Lobby. President Obama knows there is campaign money and media influence in that pairing. He also knows that he has inherited the leadership of a nation that, for the moment, at least, does not believe war is the answer to its problems. This poses a problem for President Obama and for his friends in the industrial/military complex (the 1%) and for the current right wing government of Israel. To solve this problem, until at least the start of his second term, Obama has seized upon drone warfare, which kills targeted “terrorists”, and nearby civilians, at no apparent personal cost to American families. Death by pilotless drones remain largely outside America’s media orbit. It goes unnoticed by the Republicans running to replace Obama, and it is largely unreported by US media. Drones do not require “boots on the ground”. Where are you Rachel, Ed, Chris, Fox News, and the non-cable networks? America turns its lonely eyes to you, and all they see and hear, are superficial tales of stumbling leaders. Occasionally, however, a personal story of drone warfare breaks into an American media outlet. Such a story of death by drone appeared this week in the editorial section of the New York Times, under the headline, “For Our Allies, Death From Above”. It is a story that should be read in its entirety. It reads like a short story a future Joe Heller or Norman Mailer might write after the inglorious War on Terror finally ends. The story, which is not fiction, but true, was written by Cliff Stafford Smith, an American attorney who works for Reprieve, an organization that advocates for prisoners’ rights. Last Friday, I took part in an unusual meeting in Pakistan’s capital, Islamabad. The meeting had been organized so that Pashtun tribal elders who lived along the Pakistani-Afghan frontier could meet with Westerners for the first time to offer their perspectives on the shadowy drone war being waged by the Central Intelligence Agency in their region. Twenty men came to air their views; some brought their young sons along to experience this rare interaction with Americans. In all, 60 villagers made the journey. The meeting was organized as a traditional jirga. In Pashtun culture, a jirga acts as both a parliament and a courtroom: it is the time-honored way in which Pashtuns have tried to establish rules and settle differences amicably with those who they feel have wronged them. At the meeting, Smith met a 16-year-old Pakistan boy named Tariq Aziz. The story ends with an American drone attack. It is not an ending Americans, at their best, should tolerate. The two of them had been dispatched, with Tariq driving, to pick up their aunt and bring her home to the village of Norak, when their short lives were ended by a Hellfire missile. My mistake had been to see the drone war in Waziristan in terms of abstract legal theory — as a blatantly illegal invasion of Pakistan’s sovereignty, akin to President Richard M. Nixon’s bombing of Cambodia in 1970. But now, the issue has suddenly become very real and personal. Tariq was a good kid, and courageous. My warm hand recently touched his in friendship; yet, within three days, his would be cold in death, the rigor mortis inflicted by my government. And Tariq’s extended family, so recently hoping to be our allies for peace, has now been ripped apart by an American missile — most likely making any effort we make at reconciliation futile. Israel flies American-supplied drones on a routine basis, killing Gaza civilians, at times entire families. Twitter messages from Gaza describe the sound of those pilotless, computer drones as they terrorize children and adults alike. Is there any wonder that the US and Israel are isolated from the community of nations? The most recent proof of this isolation came in the UNESCO vote that admitted Palestine as a full member. Phyllis Bennis, a Fellow of the Institute for Policy Studies, has been a writer, analyst, and activist on Middle East and UN issues for many years. She connects Israel’s influence over US foreign policy with the OWS movement. She explains the link in a Salon.com essay. We’ve been hearing a lot lately about the 1 percent — the rich, the powerful, the ones who buy off our government, impose their wars, avoid paying their taxes, you know the ones. The 99 percent — the rest of us – are the ones who pay the price. But there’s another 99/1 percent divide: over U.S. policy toward Israel and the whole world. Here the 1 percent are really on a roll. Right over the rest of us. Bennis writes that this is the time for President Obama to say No to Congress by exercising his powers of the executive branch and the defunding by Congress of UN agencies. It is time for him to say to the 99% that he agrees that the nation suffers from the grip of the 1%. UNESCO, of course, is only the beginning. But it could be the first step toward ending the control Israel has over both American foreign policy and our money-driven domestic politics. And those are words which we should have learned in school, one day long ago, words of hope breaking forth from the darkness of ambiguity. After all, Abraham Lincoln did not live in happy times. 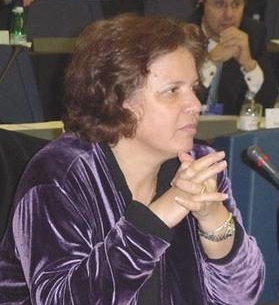 The picture of Nurit Peled-Elhanan is from Wikipedia. The video of Pete Seeger is from You Tube. The picture of Phyllis Bennis is from Split This Rock web site. This entry was posted in Media, Middle East Politics, Politics and Elections, United Nations. Bookmark the permalink. 13 Responses to What Did The Children Learn in School Today? Jim, Thank you for an amazing commentary. I loved your coining “The tribal nation of Israel”. Israeli and Zionist spokespersons obliquely refer to their “neighborhood”, with turned noses, as though their colonialist intrusion into the neighborhood automatically puts them at a higher pedestal. You also brilliantly tied together the strategies of falsely alligning the ancient Hebrew legends, or Biblical references, with the tragic Holocaust to justify Israel’s usurpation of another people’s ancient homeland. You also illuminated the common thread between the military-industrial complex and AIPAC, as the “1%” , who are seeking “Winner takes all’ position, against the 99% who are simply seeking basic human rights, freedom, justice, and human dignity. You truly did a brilliant job in relating all of it together. Thank you for your well written explanation of the injustices going on in Gaza. I’m praying for peace & justice for them. Terrribly sad that our nation has become an exporter of death, and that the President shows no desire to promote justice for the Palestinians. But, where do we turn for a really sane and compassionate foreign policy? I hope that the Palestinians will be granted membership in the part of the UN that administers justice. Israel’s crimes against humanity need to be addressed. These drones are the cruelest of weapons– unmanned vehicles controlled from far away, that terrorize and bring death to innocent people, men women and children. The two nations that routinesly use them, the US and Israel, are the two foremost war making nations in the world, who like terrorists I am ashamed to say, are killing innocent people, creating more enemies all the time. Someday, other nations and groups will obtain these drones, and we will become the victims of these weapons that bring instant death from the skys. We are not only acting immorally, we are acting like fools, inviting retaliation. Pingback: What Did The Children Learn in School Today? The following comment came in from Bruce Tyler Wick, of Cleveland, Ohio. He asked me to post this reply for him, which I am happy to do. I certainly agree Lincoln’s First Inaugural is too little attended to these days. Yet, Lincoln’s own population projections reveal his acute awareness of America’s fast-approaching world leadership. Hence, the concluding words of the Second Inaugural’s Peroration, calling attention to what would be the cruel irony of “achieving” “peace among ourselves,” only to use that peace to wage war abroad. Yes, I agree with Fred. What an important job you’re doing, Jim! I especially resonated with this blog. Years ago our Islamic/Christian dialogue group in Milwaukee made a project of examining the textbooks used in Milwaukee elementary schools in order to make people aware of and to end the bias against Islam, Muslims and Arabs expressed in some of those texts. Nurit Peled-Elhanan is a brave and good woman. I was also moved and distressed by the section on the drone strikes in Pakistan and Gaza. Speaking up for the Palestinians year after year when there is so little progress in bringing about justice for them and peace in Israel/Palestine takes a special kind of courage, determination and hope. I’m proud to know someone who has those qualities. (i) exposing the hypocrisy so piously voiced by those of the ilk of Hillary Clinton who decry “anti-semitism” in Palestinian textbooks. (ii) the misfortune that “nation states” — most particularly those who amass disproportionate power — are driven to think of themselves as “exclusively” special (…”chosen,” in a well-known Biblical context) and able to dominate and dictate to others with the racism and inhumanity that inevitably attend. (iii) the horror — so well expressed by Fred above — of drone technology and application from sterile, remote launching sites, with poor Tariq Aziz and all too many others on the receiving/killing end. As Jim alludes above, the technology is shared with Zionist Israel with observable and hidden (psychological) dimensions visited, very deliberately, on the Palestinians. (iv) the awful — and so successful! — fusion of religious and secular narratives in the Jewish/Zionist realm which surely has no close parallel in history. Poor Palestine and its regional neighbors are subjected to the worst of it, at least until they are thoroughly cowed, defeated, and subjugated. AIPAC and the whole fabric of the Zionist Lobby have taken America by stealth and focused resoluteness to the point that U.S. foreign policy on any level, any sphere, cannot be formulated without the litmus test “How will this affect Israel?” And so Israel has no constraint, no accountability, locked in a frenetic criminal psychosis which no one is willing to identify, much less begin a path of treatment and rehabilitation…. I’d like to find an ending note of optimism but cannot. The extent of my despair and indignation was put to voice by this October 27 statement which I extracted from Amb. Chas Freeman’s speech to the National Council on US-Arab Relations: “Israel (has) heretofore treated (the Palestinians and Lebanese) with contemptuous cruelty and disrespect.” My complicity as a diligent U.S. taxpayer is perhaps what hurts most…. “Contemptuous cruelty and disrespect”: hardly a formula for teaching human rights and values to the children in school today, no?